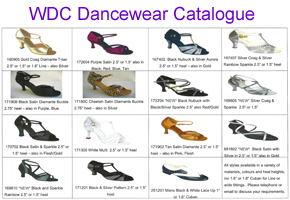 WDC Dancewear shoes are made to English sizes. The majority of our styles are made in either a regular or wide fitting. Please select the necessary width fitting from the drop down box when placing your order. Please allow approximately 4-6 weeks for wide fitting orders to be made. The colours and materials on this website may be affected by the quality of your computer and display and should be used as a guide only. The majority of our ladies ballroom/latin/salsa shoes come with hook and buckle fastening. Please adjust the buckle on the strap to give the best fitting when it is fastened into the hook. When you have done this the strap can be easily fastened and removed from the hook. We endeavour to hold stocks of all styles on this website, however, unexpected demand can consequently lead to out of stock products. We reserve the right to change design, material or specification of any product in the interest of improvement.